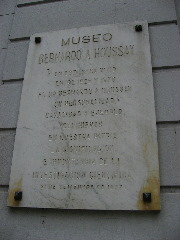 This museum contains the library and documents of Nobel Prize of Chemistry winner Bernardo Houssay. This museum is more of a library than a museum. It contains important documents, research papers and other instruments of Bernardo Houssay. Bernardo lived in this house for the last 45 years of his life and the house was named a historic location by presidential decree. Bernardo came to Argentina from France and began studying at the School of Pharmacy at the young age of 14. He has worked in almost every field of physiology, having a special interest in the endocrine glands. He earned the Nobel Prize for his discovery of how glucose is distributed by the pituitary gland..